In July 2016, I arrived on Koh Samui for the first time and instantly it felt like all my stresses were sucked away. I quickly fell in love with the island on that reconnaissance trip and returned to make it my home just one month later. Having previously led a relatively sedentary lifestyle, the effects were catching up with me, so I decided to make some big changes. I gave up alcohol completely, switched to a vegetarian diet and began exercising again, walking 10 times a week, for an hour each time. I’ve lost 16 kilos and feel like a totally new me. I currently live in a fully furnished, two-bedroom, one-bathroom bungalow in a gated complex of three homes. It’s a four-minute walk to beach bars, restaurants and 7/11 stores, a five minute drive to the ferry terminal and less than 10 minutes to the entertainment hub, wholesale supermarkets and shopping complexes. Including electricity and gardening services, my home costs me $705 per month. A typical day involves a six-kilometre sunrise walk, half of which takes me along a beautiful beach (tide dependent). Overhead, the first of the planes are flying in or taking off, while in the water, ferries and day boat trips are taking tourists out to the neighbouring islands or marine parks to snorkel, scuba dive and relax. Swimmers and paddle boarders enjoy the crystal clear, safe and tranquil Gulf of Thailand’s warm waters. I’ll grab a coffee by the beach before the workers head out for their day and later I’ll enjoy lunch with friends before taking a ride out on my bicycle or motor scooter to various beach or hillside spots. In the evening, I eat out at one of the many local restaurants for dinner. Dishes include whole fish, caught the night before and cooked in many ways, for around $8. Many parts of the island still have a sleepy village feel, with bamboo shacks, pristine beaches and very good, inexpensive food. Whether on the beach or high up in the jungle hills, I’m surrounded by coconut and banana trees. Water buffalo roam the fields—including the famous pink buffalo—monkeys climb trees picking coconuts for their handlers and the occasional elephant wanders by. 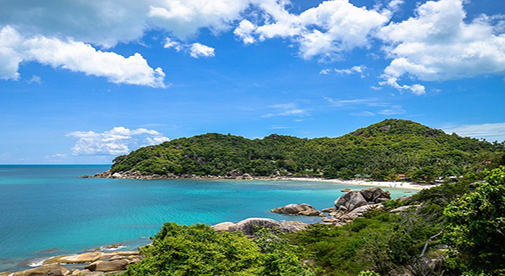 Living here on Koh Samui, I’ve learned to take each day as a gift and enjoy moments as they are presented. I have never been or felt as healthy and relaxed as I am now.